This pattern emerged from my great love of all things Pride and Prejudice. I’ve wanted to design a shawl based on this for such a long time and I’m so thrilled with the results ! The centre panel is designed to resemble tiny butterflies, and brings to mind the many walks that Lizzy takes through the countryside around her home. The cabled border reflects the relationship between Mr Darcy and Lizzy, a never ending love, intertwined from start to finish. 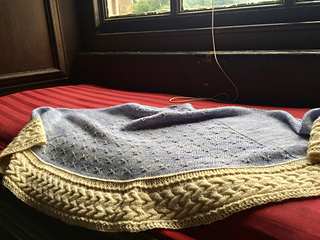 I chose a yarn base that was soft and delicate with a lovely drape, and an added sparkle. The design works best with a semi solid or tonal yarn, in two complimentary colours. 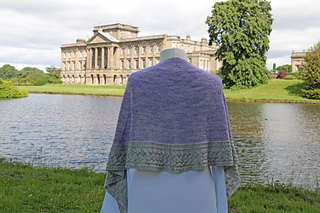 The shawl is perfect for all skill levels, having lots of interest, yet soothing to knit. 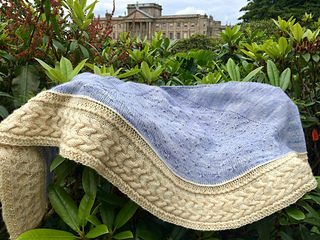 I had such fun designing and knitting this shawl, and I hope you do too !